Ice halos, Brazil imaged by João Gaspar August 29, '08 in Ilha Comprida. . Image ©João Gaspar, shown with permission. This display was seen as far away as Sao Paulo, 150 miles distant. Hexagonal ice prism crystals drifting in cold and high cirrus haze with their long axes nearly horizontal were responsible for all of the halos with the exception of the faint 22° circular. A bright and colourful circumscribed halo dominated the display, perhaps rivaled by a white parhelic circle circling the sky at the same altitude as the sun. A much rarer halo was an appearance of Wegener arcs, here unusually bright. 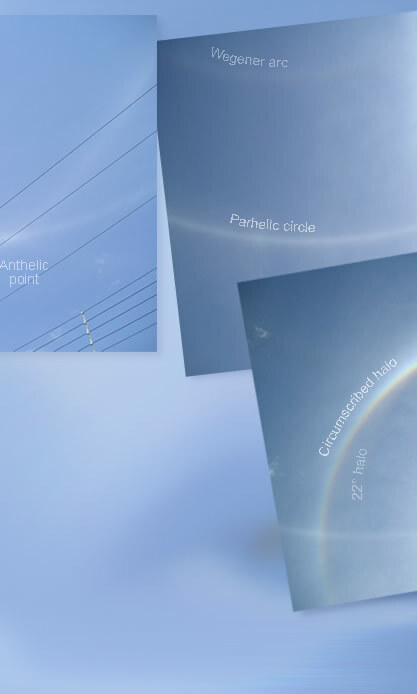 These arcs are tangent to the top of the circumscribed halo and cross the parhelic circle opposite the sun at the anthelic point. To make them, rays have to follow a awkward path through the horizontal column crystals and this combined with often imperfect crystal end faces accounts for their rarity.